"The Elvis" available here in the 5/8" section. Our dear Elvis… what to say about him? Where to begin? 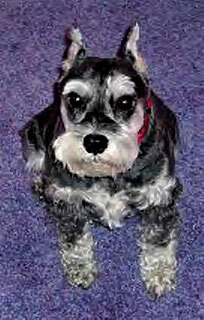 Elvis was a much-loved Miniature Schnauzer who had a personality that was indescribable! He was our first baby. Unfortunately and sadly, he passed away on August 29, 2006 from Immune Mediated Hemolytic Anemia (IMHA). Prior to August 24, 2006, we had never even heard of IMHA and its horrible complications. I’d like to share a bit about Elvis’ story, then I’d like to talk more about Elvis’ life as opposed to his death because IMHA was not Elvis or what Elvis was about – he was such a lovable easy going dog who definitely had his own likes and dislikes! But more about that later. On Thursday, 8/23/06, Elvis seemed very lethargic. He was sleeping in odd little corners of the house, which was unusual for him. He vomited once in the mid-morning, but that wasn’t so unusual for him. He didn’t seem to have much energy and he would not eat (even table food!). Sometimes he would just stand in one position while hanging his head, almost reluctant to move. In the afternoon he vomited again and I decided to bring him to his vet. At the vet, x-rays were taken and the vet said that she saw a swelling in the spleen or liver and she wasn’t sure what it was. It might have been a tumor. Elvis also appeared dehydrated. We were sent to Garden State Veterinary Specialists in Tinton Falls, NJ. It was there that they told us that he was extremely anemic and needed IV fluids and a blood transfusion. Upon his admittance, we were told that he might have a very aggressive type of cancer know as hemangioscarcoma.